Italy is an exciting country that has been thriving for thousands of years. The Ancient Roman Empire was one of the main civilisations in Europe between 31 BC and 476 AD. Over the years, the country has changed a lot, but throughout its cities, you can still get a peak at its vast history. In the country’s capital of Rome, you can see some structures that have been around since the Ancient Roman times. In cities like Florence and Venice, you can see some beautiful examples of the Italian Renaissance period of the 14th to 17th centuries. Along with its history, people travel on Italian vacations to experience the country's food, high fashion, famous wine regions, and beautiful coastal towns. In order to make the most of your time in Italy, visit as many places as you can to get a true feel for the country’s incredible culture. It is little wonder so many people plan their vacations for Italy. Planning a trip to Italy can get expensive once you factor in hotels and flights. In order to save some money on your upcoming vacations, book your trip to Italy with one of Webjet’s Italy holiday packages and deals. Webjet’s Italy packages and deals bundle together flight and accommodation costs and can help you save hundreds of dollars on your Italian adventure. Italy holiday packages are also a convenient option, saving you time on your holiday planning. Rather than searching the internet to find the best deals, utilise Webjet to find the Italy holiday packages and deals that are right for you. Instead of planning out the logistics of your trip, you can focus on planning all of the activities you will be experiencing in Italy – with some extra cash to do so! All across Italy, there are lots of airports that receive flights from overseas. The country’s busiest airport is Leonardo da Vinci Fiumicino Airport (FCO) in Rome. Other major airports include Malpensa (MXP) and Orio al Serio (BGY) in Milan, Marco Polo Airport in Venice (VCE), and Naples International Airport (NAP). Once you have arrived in Italy, you can easily travel from city to city on budget airlines or the national rail network called Trenitalia. Travelling from Australia, your vacations to Italy will include at least one stopover. Travelling from the east coast of the country, you can arrive to Italy in about 23 hours, while the flight from Perth takes about 20 hours. When flying to Italy, you’ll have a wide variety of airlines to choose from. Some of the top airlines to fly between Australia and Italy include Qantas, Emirates, Alitalia, British Airways, Air France, and American Airlines. Italy offers a wide variety of luxury resorts, traditional bed and breakfasts, and budget-friendly hotels - all available when planning Italian vacations with Webjet. Many accommodation options throughout the country offer modern comfort with lots of traditional Italian style. Simply pick the deals with the accommodation that best suits your travel style. Hotel Regno is located within a beautiful 16th-century building in the heart of Rome. Within a few minutes, you can walk from the hotel to some of the city’s top attractions, such as the Trevi Fountain and Spanish Steps. The hotel offers several rooftop terraces where guests can take in the view of the city centre. Guest rooms are reasonably priced and offer a contemporary design with a touch of Italian sophistication. Some rooms also offer a balcony overlooking the Roman rooftops. The Hotel Regno is the perfect place to base yourself for your time in Rome. Located in the historical centre of Florence, the Hotel Pitti Palace offers traditional Italian style. Guests of the hotel have access to a 6th floor terrace with gorgeous views of Florence. There are 80 guest rooms and suites designed in a sleek and contemporary Italian style. Every room in the hotel has a view of some of the top icons in Florence. While staying at the hotel, you can take advantage of its terrace and wine bar, free WiFi, bike rental, and help to organise activities in Florence. With its romantic atmosphere among the Venetian canals, Hotel Ala is the perfect option for couples visiting Italy. While the hotel is located next to a small canal, it is in the centre of all the action with easy access to many attractions. The guest rooms are designed in a traditional Venetian style with lots of elaborate touches. After a day of exploring, guests can relax on the hotel’s rooftop terrace, which offers panoramic views over Venice. Other hotel amenities include a buffet breakfast, free WiFi, and room service. Italy is a diverse and exciting country that has something to offer everyone, no matter their reason for planning vacations to Italy. Everywhere you go in the country, you’ll come across an immense amount of history. Throughout the country, you can also experience cosmopolitan city centres, the Mediterranean sea, mountains, and some of the world’s top wine regions. 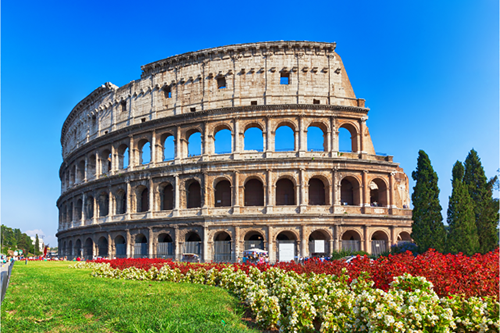 Dating back about 2,000 to Ancient Roman times, the Colosseum and Roman Forum are some of the oldest sites in Rome. During the time of the Roman Empire, the Colosseum was used as an arena for gladiator fights, animal fights, and other forms of entertainment. The nearby Roman Forum was used as a meeting place in the city for religious, political, and social activities. Within the Forum are temples to Roman gods, an ancient Senate House, and more. Today, the Colosseum and Roman Forum look much as they did thousands of years ago. Visitors to Rome are able to tour both of these landmarks to observe traditional architecture and learn more about life in the Roman Empire. To save some money, you can purchase a combined ticket for these two spots as well as Palatine Hill. Just outside the city of Naples, you can visit the ancient site of Pompeii. During the Roman Empire, Pompeii was a thriving city. However, in 79 AD, neighbouring volcano Mount Vesuvius erupted and covered the city in ash. The eruption occurred so quickly that the ash froze the city in the middle of everyday life. Buildings were kept intact, and even the remains of people and dogs were preserved by the ash. Today, you can explore Pompeii and get a glimpse into what it was like during its peak. Throughout the city, you’ll see villas, marketplaces, and a large arena. You will even see some conveniences that are still common today, such as fast food restaurants and a bar. From the city, you can also get a clear view of Mount Vesuvius–the volcano that changed the city of Pompeii in just moments all those years ago. Like much of Italy, Venice is made up of gorgeous architecture and a fascinating history. But what sets the city apart from anywhere else in the country is its lack of roads. Instead, a series of canals run through the city, making for a magical experience. The city has a Grand Canal where you can witness the hustle and bustle of the city. Head off the main stretch, and you’ll come across some of the most scenic and peaceful canals you could imagine. The most popular way to experience the canals in Venice is to take a gondola ride. Gondoliers will glide you through the city’s canals while serenading you with Italian songs. Being in a city centre that is filled with boats and gondolas rather than cars and motorbikes will have you feeling like you’ve stepped back in time.